Featuring 2 Full Length Yoga Routines! Can't decide between yoga and strength training? Why choose? Do both in a single session! Join Melissa Krieger, certified Yoga Instructor and Personal Trainer in this fast, fun and effective workout. Yoga4Strength with Weights goes beyond a traditional yoga practice; it's an hour-long yoga fusion class that will increase your overall strength, tone your core and increase your flexibility. Melissa starts with a 15-minute gentle yoga warm-up, then moves into a faster-paced, 30-minute strength-training workout, using dumbbells for resistance. A quiet yoga cool down makes up the last 15 minutes. This is a challenging workout best suited for intermediate yogis and fitness buffs as well as those familiar with Yoga4Strenth. You will need a pair of medium to heavy dumbbells for this practice. Also included is Relaxation Yoga, a cooling, calming 25 minute practice appropriate for all levels. It is a gentle, full-body stretch that can be done on it's own or following your Yoga4Strength with Weights practice. Featuring 5 Full Length Yoga Routines! Featuring 3 Full Length Yoga Routines + Resistance Band! Strength Exercises Included in DVD Case! Join Melissa Krieger, certified Yoga Instructor and Personal Trainer in this fresh and original routine. Yoga4Strength is a 40-minute moderate intensity workout that combines yoga, strength training, balance and core conditioning. Get ready for an energizing resistance-training workout mixed with yoga postures and sun salutations. This DVD also includes two tranquil yoga sessions captured in a natural, oceanside setting. The first session is a gentle relaxation routine focusing on seated and reclining postures. The second is an energizing routine focusing on standing postures and balances. Each session is a complete routine to be done alone or in combination with other sessions. Melissa focuses on teaching proper engagement of core muscles using deep abdominals and pelvic floor muscles to stabilize the spine. Energizing Yoga routines. 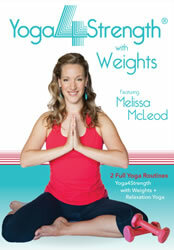 The second DVD features the all-new Yoga4Strength with Weights and a new Relaxation Yoga practice. You get five different routines to suit your different moods, energy levels and fitness requirements. At last, a collection of yoga routines that meets your changing needs. The two Yoga4Strength sessions go beyond traditional yoga, seamlessly combining strength training with yoga. More traditional yoga practices are offered through the additional three routines. Skill levels vary from beginner to intermediate. Choose a more relaxing routine for days when you just need a bit of a lift and a more challenging one for days when you want to push yourself. Whatever you're after, Yoga4Strength offers a fun, safe and effective practice. An exercise band and a pair of medium to heavy dumbbells are needed to perform the Yoga4Strength routines. Add an exercise band to your cart by clicking on the button below. Sign-up here for your Bloom Yoga email newsletter to get free online videos, blog posts and class, workshop and retreat information!